To Israel's critics, there really is only one issue to discuss with respect to the conflict with the Palestinians: the "occupation." For them, Israel's presence in the West Bank and parts of Jerusalem--the territories it gained as a result of the 1967 Six-Day War--is an outrage. The fact that Israel has not retreated from these lands, irrespective of any discussion of its rights, history or the potential consequences, remains the sole salient fact about the conflict. So it's not terribly surprising that the attempts by both the United States and Israel to pass laws forcing the Palestinian Authority to stop paying subsidies to terrorists and pensions to their families hasn't persuaded foes of the Jewish state to reverse their thinking. They don't even seem to consider what Abbas's Fatah and its Hamas rivals are doing to ensure that peace hasn't broken out, let alone to stop complaining about the "occupation." Yet those who put the lion's share for the continuation of the conflict on Israel, the Netanyahu government and American supporters really should pay more attention to the facts on the ground. The Knesset passed legislation last week that forced the government to withhold transfer of tax revenues to the Palestinian Authority in proportion to the amounts that Ramallah pays to terrorists imprisoned in Israel, as well as in pensions to the families of those who have committed acts of terror. This so-called "pay to slay" act is a potentially devastating blow to the P.A. since it receives nearly half of the $5.2 billion it spends every year from taxes collected for it by Israeli authorities. This comes after the U.S. Congress passed the Taylor Force Act back in March, which would similarly withhold U.S. aid to the P.A. if it continues subsidizing terrorism. But the potential loss of so much money hasn't moved the P.A. to even discuss halting the flow of funds to terrorists and their families. In 2018, it will spend about $360 million, approximately 7 percent of all of its revenues, on the various "heroes and martyrs" funds that go to those who kill or wound Israelis, or seek to do so. On Sunday, P.A. leader Mahmoud Abbas reiterated this stand, saying that nothing would interfere with this practice. To the Palestinians, this is not merely social-welfare spending for an estimated 35,000 families; it is also a matter of patriotism. The PLO--the parent group of the authority that Abbas rules despotically--has been doing this since it came into existence in 1965. The fact that this predates the "occupation" of the West Bank by two years should serve as a hint to observers as to the true cause of the conflict. But the point here is that the P.A. 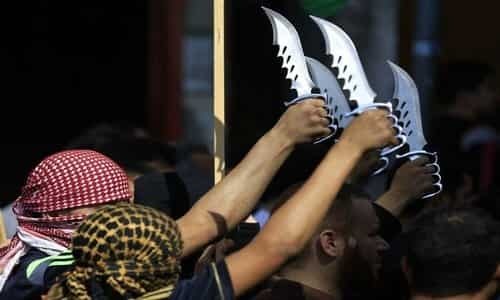 is not shy about saying why "pay to slay" is integral to what it means to be a Palestinian. Abbas and his Fatah Party, as well as Hamas, sees those who get the money as carrying out the national will of the Palestinian people. They believe these "heroes and martyrs" have every right to "resist" the presence of Jews on any part of the land on which the two peoples live. That is why we need to ask Israel's critics what it is they are actually protesting when they talk about the "occupation." To those who see the existence of a Jewish state on any part of the territory between the Jordan River and Mediterranean Sea as a wrong that should be righted, it doesn't really matter what the Palestinians do. If you think Israel shouldn't exist and that Zionism is a racist crime, then all Palestinian acts of "resistance"--up to and including the most bestial acts of terrorism and mass murder--is both understandable and justified. If "occupation" means all of Israel, which is how the most Palestinians consider any land over which Jews have sovereignty, then there's nothing really to talk about. Along with Fatah, Hamas and Islamic Jihad, that's also the perspective of groups that oppose Zionism elsewhere, including the United States. Their concern about the "occupation" isn't a protest about West Bank settlements. Supporters of BDS and opponents of Zionism, like the Jewish Voice for Peace and IfNotNow groups, are similarly either indifferent to or opposed to Israel's continued existence, and therefore just as uninterested in Palestinian terror. But if your objection to the "occupation" is that it is an obstacle to a two-state solution or harmful because it presents a theoretical long-term challenge to Israel remaining both a Jewish and a democratic state, then "pay to slay" isn't merely a right-wing talking point, as so many on the Jewish left seem to be asserting. If you actually believe in a two-state solution, then instead of bashing the government of Israeli Prime Minister Benjamin Netanyahu or the administration of U.S. President Donald Trump, there's a more productive use of your efforts. It would be a lot smarter to do everything in your power to convey to the Palestinians that paying terrorists only convinces Israelis that rather than bringing peace, a two-state solution would only make their situation more precarious. As long as Palestinians see terror and the war on Zionism as an inextricable part of their national identity, then most Israelis, including the majority who are not ideologically committed to keeping all of the territories, understand that Palestinians believe that Tel Aviv is just as much of an "illegal settlement" as the most remote hilltop outpost. Under those circumstances, they see a repeat of former Israeli Prime Minister Ariel Sharon's Gaza experiment in the far more important West Bank as just a recipe for more bloodshed. That's why those groups who clamor the loudest for peace now should also be screaming even louder about the "pay to slay" policy. If they won't, then they can't claim to be surprised when most Israelis say any talk of ending the "occupation" is not so much ill-advised, but downright crazy. Originally published at JNS.org - reposted wit permission.